“Bobby” (Denzel Washington) takes “Stig” (Mark Wahlberg) with him across the border into Mexico, for a meeting with the leader of a drug cartel that Bobby had made a deal with. Bobby would give “Papi Greco” (Edward James Olmos) some fake passports that would not be detected and in return he would get $100,000 worth of cocaine. But for some reason, Papi Greco gives him the cash and refuses to exchange it for cocaine. Bobby tosses it back and he and Stig head back to the U.S. Once back across the border, they are promptly arrested by the DEA. Stig doesn’t know that Bobby is actually an undercover DEA agent and he’s been “working” Papi Greco for a long time. 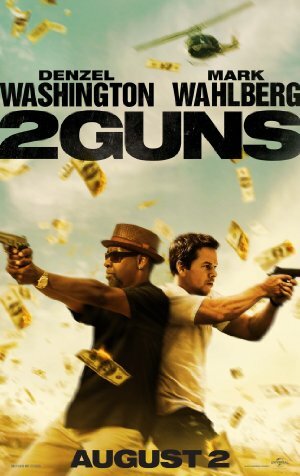 Welcome to 2 Guns. Bobby’s control, “Deb” (Paula Patton) and Bobby don’t know that Stig is actually a Navy SEAL, working undercover on orders from his commanding officer, “Lt Commander Quince” (James Marsden). Stig proposes robbing a bank in a town near the border and Bobby likes the idea. He plans to use the money to prove that Papi Greco is laundering his money through the bank. Quince had ordered Stig to steal the money, claiming it would be used to fund the Navy’s operations against the cartel. They believe they will find $3 million or so in the bank. But they find $43 million and it turns out it doesn’t belong to Papi Greco. It’s the CIA’s money and they dispatch one of the operatives, “Earl” (Bill Paxton) to recover it. He has carte blanche to do whatever he has to in order to recover the money. Then Bobby gets framed by Earl for the murder of his lead agent and Quince leaves Stig out in the cold after failing to kill him. Confused yet? It makes sense when you sit down and watch it, assuming you can suspend your sense of disbelief and just enjoy the action and one-liners. Wahlberg and Washington have terrific chemistry. It turns out that Deb is not just Bobby’s control, but she’s also his lover. She also has another boyfriend and who it is ends up being a bit of a surprise (no, it isn’t Stig). Komakur, who did an amazing job with last year’s The Deep, delivers a pretty good action/comedy with 2 Guns. Edward James Olmos is a credible villain, sufficiently sinister to convince you he’d cut your head off as soon as look as you. But it’s Bill Paxton who shines in this. He is magnificent as the CIA agent who would kill his best friend if that would get the job done, and wouldn’t feel a single iota of guilt about it. There are sufficient “booms”, chases and tense moments to satisfy all but the most incredibly hard-core action fanatics. Stop at the concession stand on the way in and grab the large popcorn. Maybe even the extra-large. With a running time approaching two hours, you may need it.